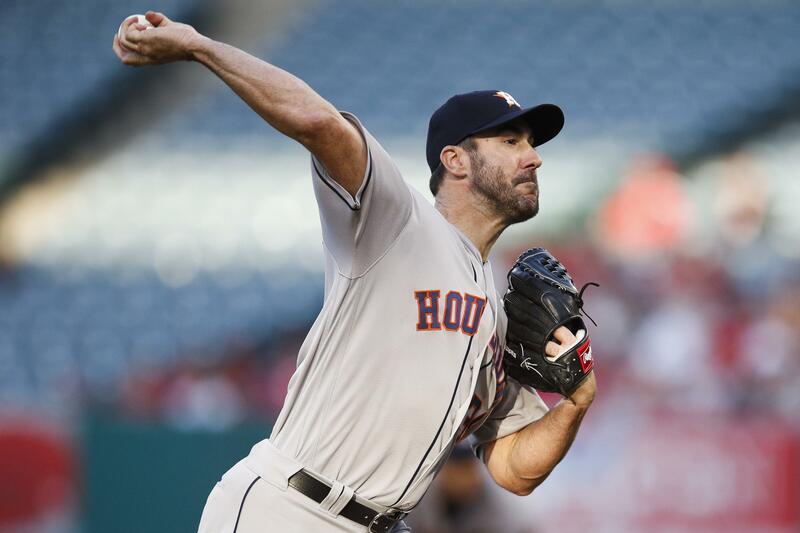 Wed., May 23, 2018, 10:56 p.m.
Justin Verlander got some run support for the first time in nearly a month and led the Houston Astros over the San Francisco Giants 4-1 on Wednesday. Verlander (6-2) struck out nine and walked one in six innings, allowing one run and three hits as his major league-leading ERA rose slightly to 1.08. He had given up just three runs over 29 innings during his previous four starts, but the Astros had scored just three runs in that span, getting shut out twice. Ken Giles pitched the ninth to remain perfect in nine save chances. George Springer hit a tiebreaking, two-run homer in the fifth on a 93 mph fastball from Jeff Samardzija (1-3), driving the ball off the facade above the left-field seats. Carlos Correa added an RBI single later in the inning. Indians 1, Cubs 0: In Chicago, Adam Plutko carried a no-hitter into the seventh inning and Andrew Miller provided stellar relief work, helping Cleveland beat Chicago. Plutko (2-0) struck out four and walked four in his second major league start. The right-hander was promoted from Triple-A Columbus to replace the struggling Josh Tomlin in Cleveland’s rotation. Michael Brantley, Francisco Lindor and Rajai Davis had two hits apiece as the A.L. Central leaders won for the third time in four games. The Indians completed a sweep of their two-game set versus the Cubs in their first appearance at Wrigley Field since they lost the 2016 World Series. Chicago’s Jon Lester (4-2) allowed six hits, struck out four and walked one while lowering his ERA to 2.37 in his 10th start this year. Rangers 12, Yankees 10: In Arlington, Texas, Jurickson Profar had a bases-clearing double to put Texas ahead to stay in a wild, series-clinching win over New York, which matched a major league record with four more homers. Gleyber Torres became the youngest Yankee ever to homer in three consecutive games and Aaron Judge hit a 471-foot blast as New York became only the third team in major league history with 21 homers in a five-game stretch – 12 of those in Texas. Didi Gregorius and Neil Walker also went deep for the Yankees. Torres and Judge both homered during a six-run fifth to put New York ahead 10-5. The Rangers then scored twice in the bottom of the fifth, and an inning later got Profar’s three-run double to make it 11-10 after reliever David Robertson (3-2) had already given up a bases-loaded walk. Brewers 9, Diamondbacks 2: In Milwaukee, Travis Shaw hit a three-run homer and Jesus Aguilar had a go-ahead, two-run single during a seven-run fourth inning to help Milwaukee send Arizona to its seventh straight loss. Brent Suter (4-3) allowed two runs and four hits in 5 2/3 innings as the N.L. Central-leading Brewers moved a season-high 12 games over .500. Milwaukee’s 31-19 start is the team’s best over 50 games in franchise history. Arizona has lost 13 of 14, falling out of the NL West lead while scoring just 26 runs in that span. The three games marked the Brewers’ first sweep of the Diamondbacks since June 2-4, 2008. Zack Godley (4-4) gave up a season-high eight runs – six earned – and seven hits in 3 1/3 innings. Phillies 4, Braves 0: In Philadelphia, Jake Arrieta (4-2) struck out seven in 6 2/3 sharp innings, Carlos Santana’s swinging-bunt broke a scoreless tie and Philadelphia beat Atlanta. The Phillies took two of three to win their first series against the N.L. East-leading Braves in four tries and closed to within a half-game of first place. Seranthony Dominguez retired the four batters he faced after entering with runners on second and third in the seventh. Hector Neris pitched the ninth to complete the eight-hitter. Braves starter Luiz Gohara (0-1) gave up two runs and four hits in four innings. Marlins 2, Mets 1: In New York , J.T. Realmuto and Starlin Castro each hit an RBI single off closer Jeurys Familia in the ninth inning, and Miami rallied past New York. Jacob deGrom dodged trouble throughout seven scoreless innings and Brandon Nimmo homered in the fifth for the Mets, who carried a slim lead into the ninth. But the Marlins broke through against Familia (2-2), who has four blown saves in 17 chances this season. Familia was booed by the crowd of 24,808 after Castro’s hit and again when he got out of the inning. Adam Conley (1-0) pitched a scoreless inning and Brad Ziegler worked the ninth for his ninth save, retiring pinch-hitter Wilmer Flores with a runner on second to end it. Angels 5, Blue Jays 4: In Toronto, Shohei Ohtani hit a tying two-run single in the ninth inning, Andrelton Simmons added another two-run hit and Los Angeles rallied to beat Toronto. Toronto turned to Tyler Clippard (4-2) in the ninth to protect a 3-1 lead, but he loaded the bases with consecutive walks to Mike Trout, Justin Upton and Albert Pujols. Ohtani broke his bat but lined a single to center for his first hit of the series, and Simmons chased Clippard with a single through the drawn-in infield. Justin Anderson (1-1) pitched one inning for the win and Blake Parker survived a shaky ninth to record his third save. Royals 5, Cardinals 2 (10): In St. Louis, Drew Butera had a two-run single in the 10th to lead Kansas City past St. Louis. Bud Norris (1-1) pitched a perfect ninth, but couldn’t record an out in the 10th, giving up back-to-back singles to Jorge Soler and Alex Gordon before compounding the issue by committing an error on Alcides Escobar’s sacrifice attempt to load the bases ahead of Butera. Red Sox 4, Rays 1: In St. Petersburg, Florida, Xander Bogaerts sparked a three-run rally in the ninth inning, David Price pitched the bulk of a three-hitter and Boston won its fourth straight. Bogaerts doubled off Alex Colome (2-5) to drive in J.D. Martinez, who reached on a throwing error by shortstop Willy Adames to lead off the ninth. After a wild pitch, Eduardo Nunez drove in a run with a sacrifice fly, and Boston tacked on another on a passed ball. Price pitched three-hit ball over six innings, allowing a run while striking out nine. Joe Kelly (3-0) got the win and Craig Kimbrel pitched the ninth for his 15th save. Padres 3, Nationals 1: In Washington, Christian Villanueva hit a two-run double, Tyson Ross pitched into the seventh inning and San Diego salvaged the finale of a three-game series against Washington. Ross (4-3) didn’t allow a runner past second base until the seventh, struck out nine and yielded one run in 6 2/3 innings. Brad Hand recorded the final five outs for his 15th save, escaping a two-on, one-out jam in the ninth by inducing Spencer Kieboom to ground into a game-ending double play. In his season debut for the Nationals, Erick Fedde (0-1) allowed three runs and four hits while striking out six in 5 2/3 innings. Pirates 5, Reds 4 (12): In Cincinnati, Josh Harrison tripled in the go-ahead run off Dylan Floro (1-1) in the 12th inning – his fourth hit of the game – and Pittsburgh rallied after wasting a late lead. Tigers 4, Twins 1: In Minneapolis, Michael Fulmer won for the first time in four starts, Niko Goodrum ended an 0-for-14 skid with a home run and Detroit stopped a five-game losing streak with a win over Minnesota. Fulmer (2-3) allowed one run and four hits in 5 2/3 innings with five strikeouts, improving to 4-0 against Minnesota as he threw a season-high 112 pitches. He had lost his previous three starts, allowing 14 earned runs in 16 1/3 innings. Shane Greene pitched a perfect ninth for his 11th save in 14 chances, completing a five-hitter. Goodrum, Nicholas Castellanos and Victor Martinez had two hits each for the Tigers. Kyle Gibson (1-3) gave up three runs and six hits in six innings. White Sox 11, Orioles 1: In Chicago, Dylan Covey (1-1) tossed seven strong innings for his first major league win, Yoan Moncada and Adam Engel each hit three-run homers and Chicago pounded Baltimore. Jose Rondon added his first major league homer as last-place Chicago rolled to its fifth win in seven games. Baltimore, last in the A.L. East, has lost four of five overall and is 5-21 on the road. Alex Cobb (1-6) lasted just 3 2/3 innings, his shortest outing since April 19. The right-hander allowed six runs on eight hits. Mariners 1, Athletics 0: In Oakland, California, Marco Gonzales allowed two hits in seven innings in the longest start of his career, and Seattle scored its only run on an error in a victory over Oakland. Gonzales (4-3) struck out six and walked two, combining with two relievers on a three-hitter as Seattle recorded its fourth shutout of the season. The Mariners have won five straight and seven of their last nine. Over his last two starts, the 26-year-old left-hander has allowed one unearned run in 12 2/3 innings. Daniel Gossett (0-2) allowed one unearned run on four hits in seven innings in his third big league start of the season and first since he was optioned to Triple-A Nashville on April 7. The Mariners scored in the top of the fourth when Guillermo Heredia doubled leading off the inning. He was at third with one out when A’s shortstop Marcus Semien bobbled Kyle Seager’s fielder’s choice grounder before he could get off a throw. Dodgers 3, Rockies 0: In Los Angeles, Kenta Maeda tossed two-hit ball into the seventh inning and struck out a season-high 12 to help Los Angeles beat N.L. West-leading Colorado for its second straight series win. The Japanese right-hander didn’t give up a hit until the fifth inning, when Ian Desmond singled to right with one out. Maeda (4-3) walked four over 6 2/3 innings in earning just his second win since April 18. Kenley Jansen struck out three and allowed a single to Trevor Story in the ninth for his 10th save. Published: May 23, 2018, 10:56 p.m.